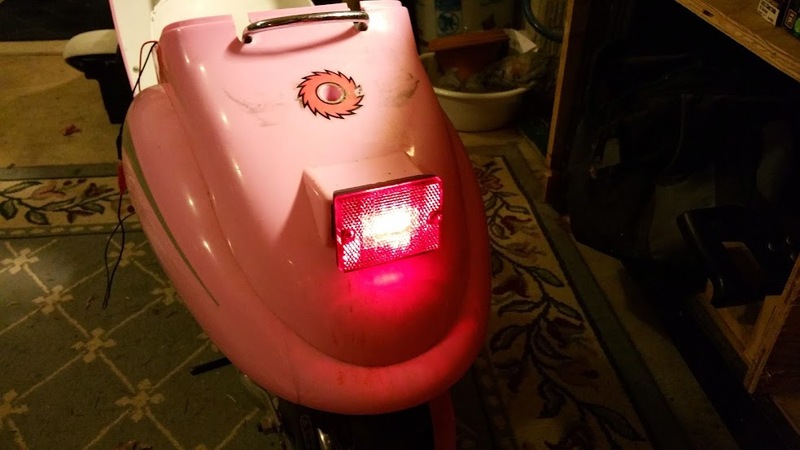 My daughters Razor Pocket Mod (Bella) needed a little spicing up, so I decided to add a tail light and a headlight. 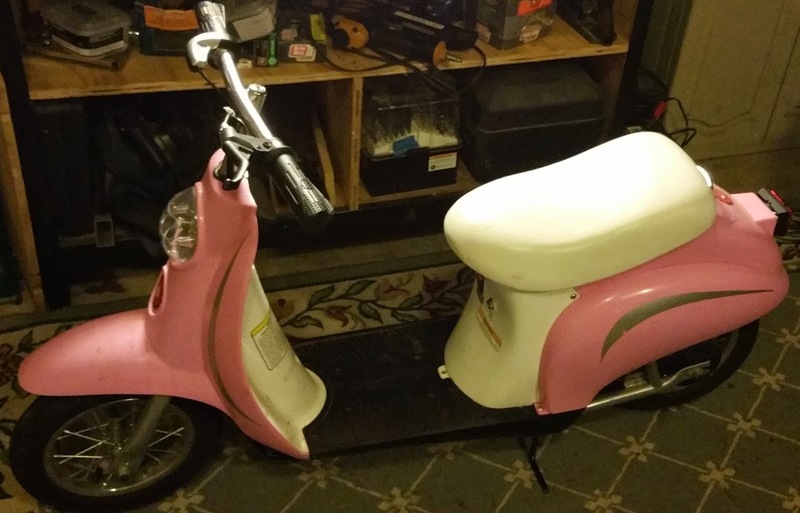 This mod would give her another new feature to be excited about, and improve safety. 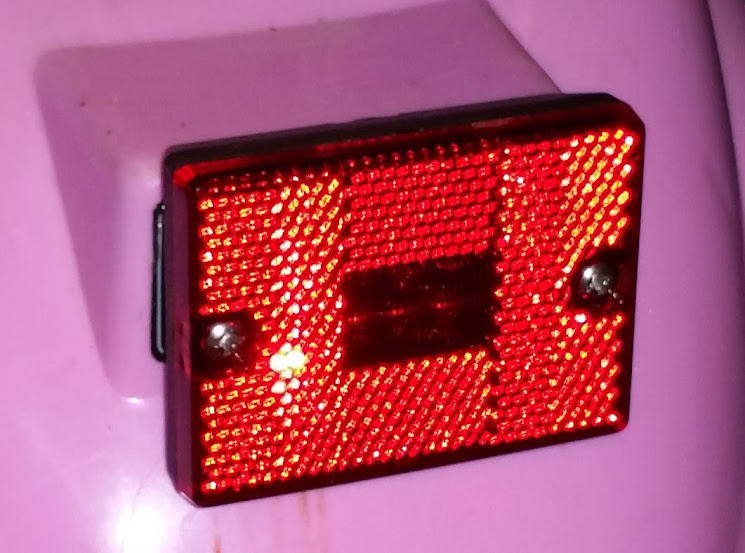 I went to Mike's Trailer Hitches in Riverdale, Ga. and picked up a red LED marker light to use as the tail light, and a white LED tag light to use as the headlight. 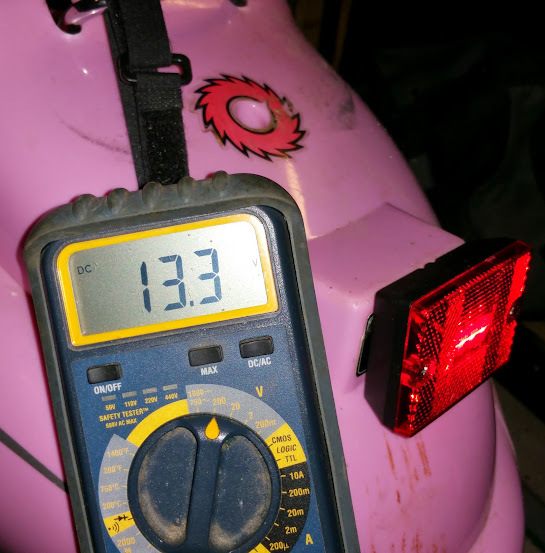 I choose LED lights because they are low current, won't burn out during the useful lifespan of the scooter, and because they functions as a diode (See "Special power considerations" below). The tail light installation was so simple I forgot to take pictures. It mounts with one bolt, so I drilled a 5/16" hole for mounting and a 1/4" hole for the wires. 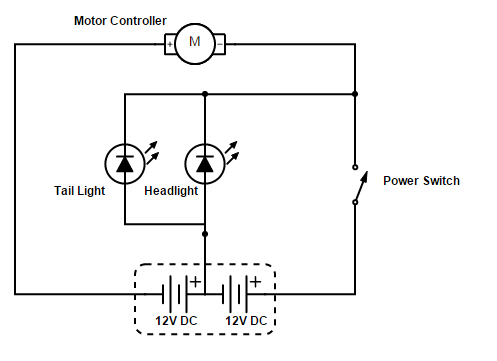 The installed light can be seen in Figure 1 above. Installing the headlight was a little trickier, but not terrible. 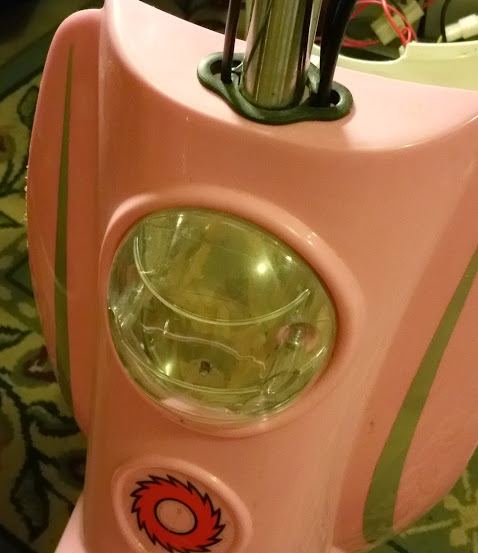 The faux headlight is a plastic dome, which will make a perfect cover for the installed light. First, I removed the faux headlight, then began drilling with a 3/4" holesaw. This is where it got interesting. The steering gooseneck was only 1/4" behind the plastic fairing, thus preventing the hole saw from even making contact with the plastic. This meant removing the entire fairing to drill the mounting hole, a step I had not planned for. 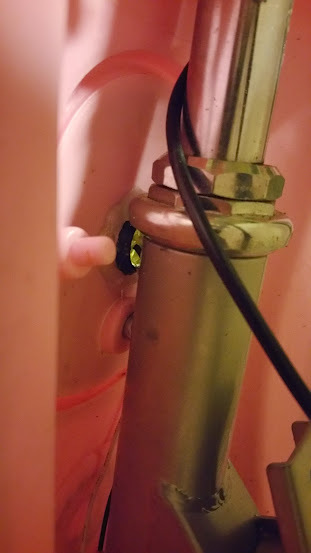 It also caused the light to be forced forward about 3/8". Once installed the gooseneck forced the light forward about 3/8". This proved not to be a problem as the gooseneck does not move relative to the fairing, and the light protruding would be hidden by the faux cover. Since the light wasn't snug in the mounting hole as a result of the protrusion, I applied some hot glue to the rear of the light to secure it. Wiring proved to be a little tricky. 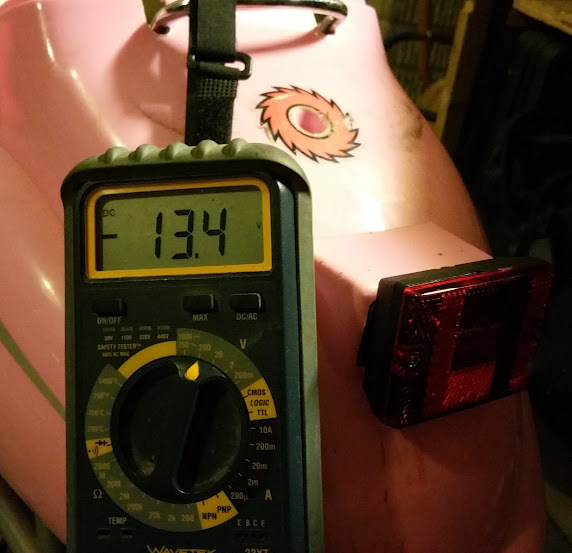 The lights are 12V and the system is 24V. 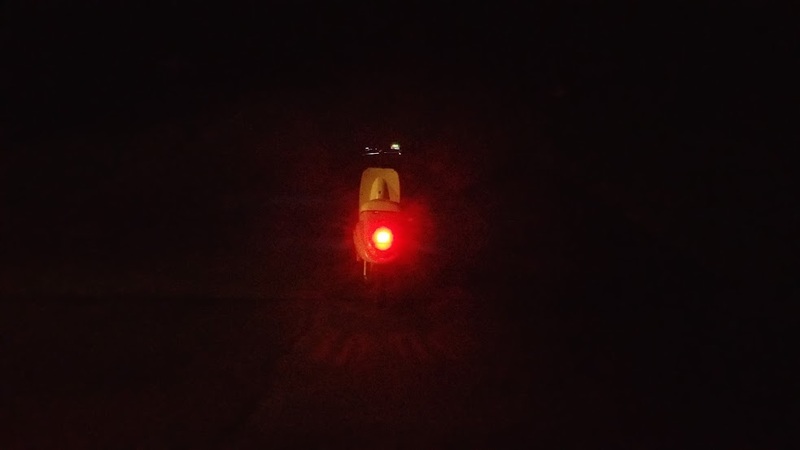 Also, for safety I wanted the lights on anytime the scooter is powered up. Finally, for simplicity I wanted the lights to go off with the main power switch to prevent the need for a second switch. 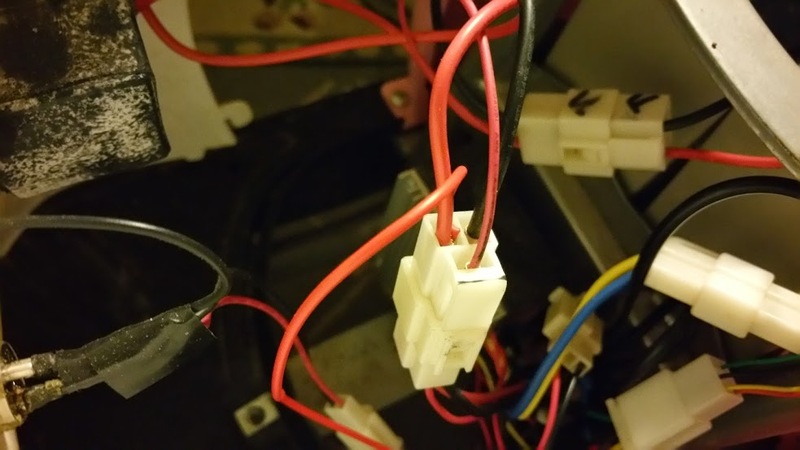 To tie the lights to the main power switch, I pulled the positive DC pin from the controller wiring harness, soldered a piece of 18ga wire to it, and reinserted it into the connector. Since the controller power is switched on/off by the main power switch, this would give me power only when the main power switch is on. Below you can see the skinny red wire leaving the connector from the same place as the Red power wire. Because we are tapping the batteries mid-stack, current can flow forward (+12V) and backward (-12V) relative to our new device. This means that a device placed in circuit where our lights are located in Fig 9 would experience +12V when on and -12V when off. 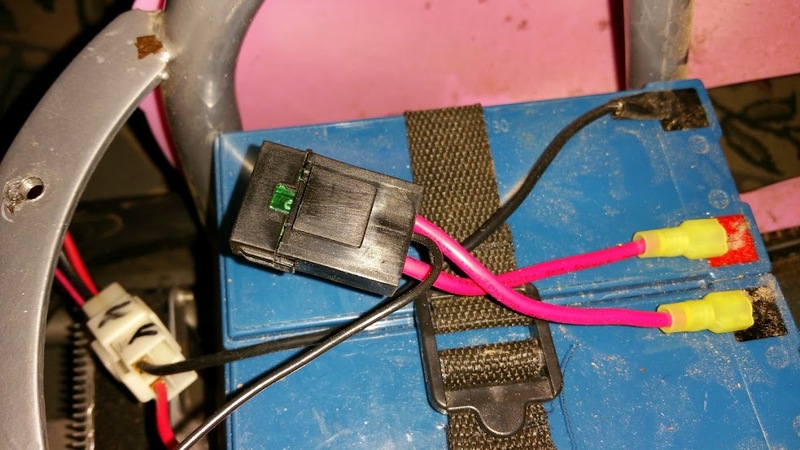 This is unacceptable because it would drain the battery in storage, and expose the controller to voltages (-12VDC) for which it is not designed. To resolve this problem, we must add a diode to the new circuit branch to prevent reverse current flow. This is where the LED lights come in. Because they are diodes, they flow current (and illuminate) when the switch is closed and appear as an open circuit when the switch is closed. This makes them ideal for this application. With lights installed and power configured, all that was left is to connect the lights to our power taps and dress the wiring. For the connections we used insulated spade lug connectors. to prevent shorts. The new wiring was semi-neatly dressed to the frame and held in place with zip ties. 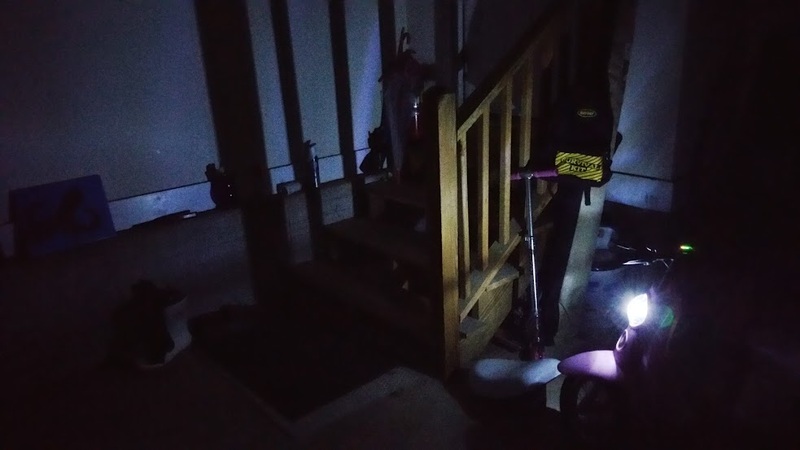 Below are some pictures of the lights in action. 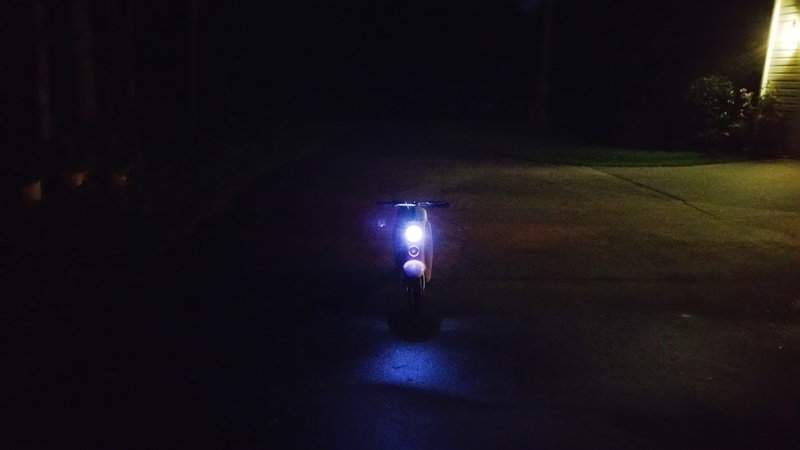 With a total cost of about $15, Tail lights and head lights are a great safety modification for your Bella Pocket Mod Scooter, and they are lots of fun for your kids. 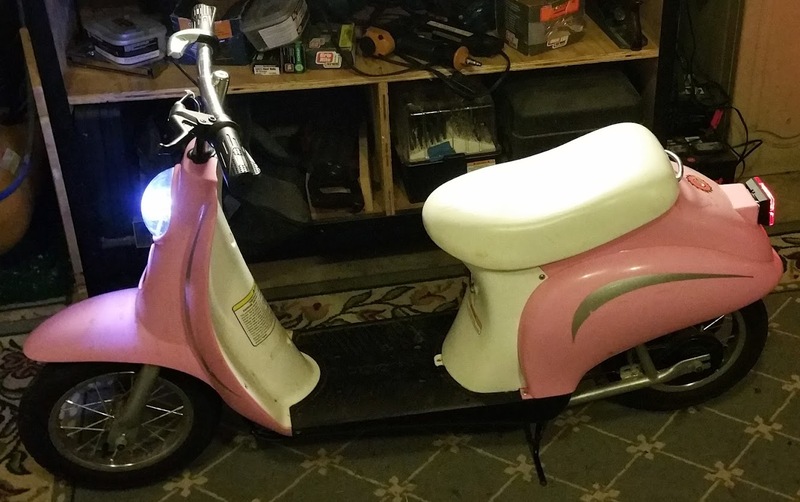 I think my next mod will be to install a flasher circuit into the tail light that activates when the brake is applied.